She found herself in Seoul, South Korea, where for three months she studied traditional South Korean folk singing and drumming. Meanwhile the lure of singing was becoming much too great to resist. She had already fallen prey to the charms of Portuguese music and soon an opportunity to travel to Brasil came knocking. Once there Miss Cano spent seven months in Rio de Janeiro drinking in the mesmerising music of Brazil and it wasn’t long before she “went native” playing, singing and feeling her way into Brasilian life and she was soon adopted into the Carioca music scene. It’s easy to see how Miss Cano might have “gone native” in Rio albeit in such a short span of time. Miss Cano has the ability to not simply transform herself into the characters she sings about or plays on stage, but to “become” them so convincingly that she seems to shape-shift like some mythical Valkyrie as she traverses the cultural topography from North and South America to as far as Europe and even the Far East. Surely this is what must have drawn the Cree musician, poet and playwright Tomson Highway to Miss Cano. In 2001, the playwright cast her in the lead role of Emily Dictionary in his play Rose. That was followed by title roles in The Incredible Adventures of Mary-Jane Mosquito the story of a whimsical and wise, wingless little mosquito from Manitoba. The play was commissioned by and staged at the prestigious Stratford Music Festival. “I have always been deeply honoured,” Miss Cano says “that Tomson has trusted me with his incredible art. We’ve travelled all over the world with his beautiful work. I am in love with it all,” she adds, “from the cabaret Kisageetin. Like all his work this cabaret written and performed in Cree. We did that for the first time in Sudbury, at Le Théâtre du Nouvel-Ontario. That was followed (in 2010) by performances at the Banff Centre for the Arts, as well as Toronto’s Canadian Stage Berkeley Theatre,” she say, proudly. 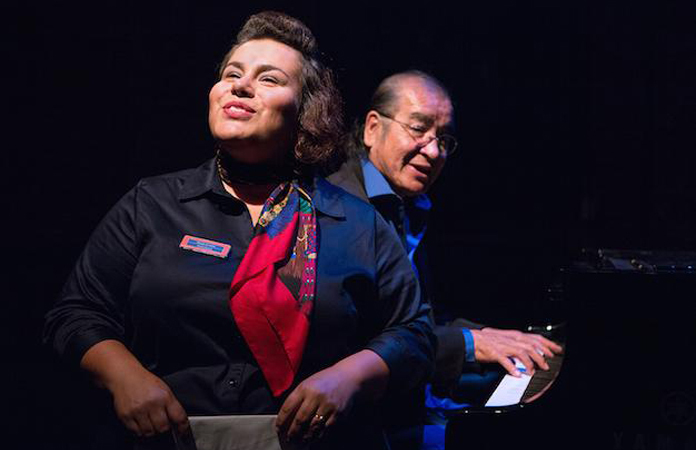 Of course the performance for which Miss Cano is best known is in the French National Arts Centre co-production, of Mr Highway’s one-woman musical The (Post) Mistress. She was cast in the (sole) role of the Franco-Ontarian postmistress named Marie-Louise Painchaud. If you missed the performance you can take some comfort in listening to the gorgeous songs that have been brought to life by Miss Cano on celebrated CD, which also features Mr Highway (playing piano on one song and providing vocal harmony on another and the saxophonist Marcus Ali also returns, playing saxophone and clarinet – both of who played on the theatrical production). The CD also features a constellation of Canadian musical stars such as Ted Quinlan on guitar, George Koller on contrabass, David Restivo on piano, Mark Kelso on drums, Gordon Sheard on piano and Luis Orbegoso on percussion. Despite the fact that (on CD, at least,) we miss the otherworldly effect of Teresa Przybylski’s post-office set Miss Cano as Marie-Louise Painchaud is breathtaking as disposes of her dizzying music with staggering panache as she adds lyricism, humour and melting beauty to the music. The lustre of her timbre and the grace of her execution are truly sensual and extraordinary.